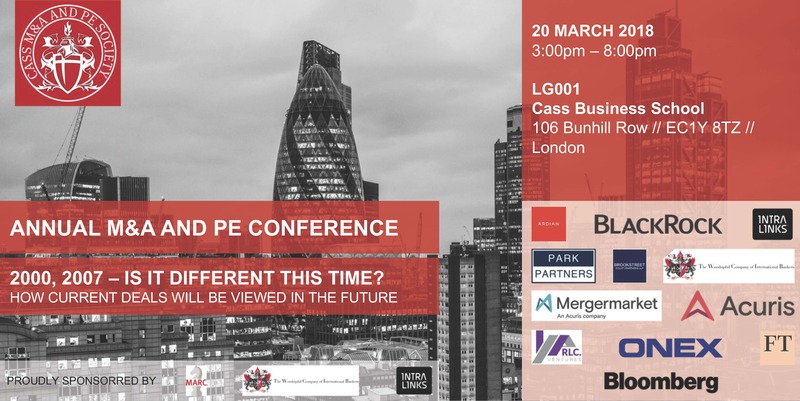 Cass M&A and PE Society is proud to announce our biggest event of the year, the Annual M&A and PE Conference. The conference has been the highlight of the academic year for the past 6 years, and we're delighted to build upon that history with the latest iteration: "2000, 2007 - Is it different this time? How current deals will be viewed in the future". This year the focus is upon uncertainty in the M&A market and a Private Equity market awash with cash, and we are delighted to announce panels to match the billing. Hear from leading Researchers, Investment Bankers and Private Equity practitioners in dedicated panels for each; with ample time to network between each.